We can't wait to see you at Riverfest 2019! Registering online means less paperwork for you! 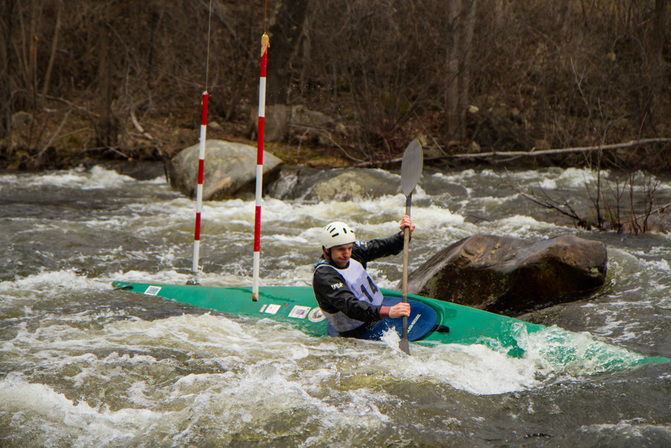 The Mascoma Slalom has ran every year since 1963 and is the oldest consecutively run slalom race in the country. Dartmouth College's Ledyard Canoe Club hangs temporary gates on the Mascoma and lays out the course. Then, we take it all down after the race. The event draws a wide variety of competitors, from nationally ranked slalom boaters to creek boaters who have fun just trying to make a couple of the gates! The Mascoma is class II-III, depending on levels. Logistics: The Mascoma Slalom will take place on Saturday, April 20th. Registration will begin at 8am. Racers may run practice laps after they register and before the mandatory racer meeting at 9am. It costs $20 to compete in the race, $15 for Dartmouth students. Payment can be either cash, check, or DA$H for students. ​CANCELLED: The water level looks dangerously high for Sunday 4/21 so the Wells River Rumble 2019 will be pushed to the following Sunday 4/28. Reigning champion Rogan Brown leads the pack. The mighty Wells River is a tributary of the Connecticut River in northern Vermont. It is a small class IV creek, featuring six named drops, and dropping 86 feet over 1 mile. Check out the AW description here (it makes it sound more intense than it is though...). 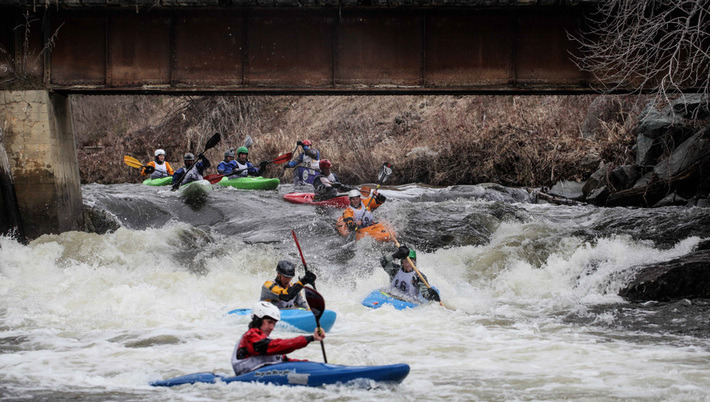 The Wells River Rumble is a mass-start, downriver race that has been taking place on the Wells for many years now. When Riverfest began in the spring of 2009, the Rumble was integrated as one of the main events. This race is now contested in two stages: first, a mass-start race down the entire length of the river, which is used to determine the seeding for the heats. The second stage is a boatercross stage race that makes for even more exciting head-to-head action. Logistics: The Wells River Rumble will take place on Sunday, April 21st. Registration will begin at 8:45am. Racers may run practice laps after they register and before the mandatory racer meeting at 9:30am. It costs $20 to compete in the race, $15 for Dartmouth students. Payment can be either cash, check, or DA$H for students. Important Note: We're only going to run the Wells if the level is below 1,000 cfs. Between 800-1,000, it will depend on how many volunteers we get for safety. Below 800, we're good to go. If the Wells is too high, we have some backup options for another race. What would a kayaking festival be without a party? At 9pm on Saturday, April 20th, we will celebrate the weekend's festivities in style. Sponsors will be there with their goods, and we'll be raffling off some of their products. With free beer, live music, and prizes to be won, this year's festival party promises to be as fun as ever! We will be screening a conservation-themed film at 7pm on Thursday, April 18th, with free beer for guests over 21. We aim to increase awareness of salient issues pertaining to the environment and, specifically, rivers. In past years we've shown films such as Damnation, which considered the ecological effects of creating and destroying dams on major rivers, and Trashed, which looked at the hazardous effects of waste floating in the Pacific Ocean.